The pics were only of the box artwork so couldn't see the exact content or models and there were no prices, but the Lord Felthid box was of a Lord in Cataphract armour with a Manreaper, and three Plague Marines around him. 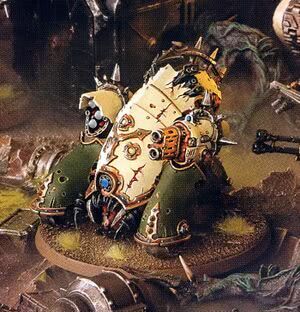 Being a smarty pants I didn't get a pic, and there was no details of when they will be released, but at least the Blight Hauler is on the way! Edited by Kobrakei, 15 November 2017 - 05:39 PM. A Redemptor as a snap fit? Its such a huge kit I cant wrap my head around that! Very curious and I would certainly welcome more dreadnoughts. Hmmm... a named Death Guard HQ? My interest is piqued. Does he come with a ranged weapon (please say yes)? Really excited for the Haulers. You cynical old git you. Very curious to see how the Redemptor works out, I imagine the pose might end up being static ala the B@C dread. Seems odd that they would release a character who wasn’t in the codex so soon after it was released. It’s not just the dude from Dark Imperium is it? Maybe he’s like the Plague surgeon, named but not really a special charcter. If he has a Manreaper, then he fills the option in the codex to have a Lord of Contagion equipped with a Manreaper, and so fulfills the GW quota to have no rules without models. The Death guard one is called Lord so and so's the Tainted Cohort. Wonder if this is The Tainted that Necrosius and Mamon are apart of. Easy to build would explain why the Hauler has no options. Also, MORE DEATH GUARD STUFF! Woooo. Glory to the 14th. Yeah just saw the pic on FB. The Blighthauler box is art of 3 haulers. Does that mean you get 3 of them in one kit? Either way, should be cheaper to buy these models as easy to build kits, I assume? Any chance to share the pics or at least the link? Its rather curious that GW is making a new snap fit stuff for new kits, I understood the first batch was to supplement Dark Imperium box but a new wave of snap fits is interesting. Edit: Plague Cohort are Terminators!!!!! Edited by Plaguecaster, 15 November 2017 - 11:34 PM. More Death Guard minis, awesome, especially the Blight Haulers. Edited by Shockmaster, 15 November 2017 - 11:36 PM. Whats on the bottom right? I can't quite make it out. A box and ??? It's the Foul Blightspawn and the guy with the super flamer. I'm more excited about those Easy to Build Deathsrhoud and Leviathan...$60 was a little too much for my wallet around christmas, but maybe these will be about $30? 2 of the DG clampack characters. I think. The death-shroud aren't easy to build. Anyway, hopefully the box comes with 3 of the buggers. Pleasant surprise. Box says 'hauler' not 'haulers,' so there should only be one in the box. Edited by Marshal Loss, 16 November 2017 - 01:53 AM.